I always make sure I have plenty of wine on hand. (You know I like wine, right?) 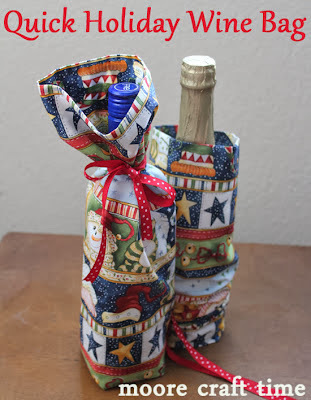 With the holidays coming up, I make sure I have even more since a bottle of wine makes a great hostess gift. 30 Minute Crafts has a great tutorial on how to whip up a festive wine bag. These are adorable and easy, and could be done in any festive fabric that you choose. Click here for the full tutorial!